We develop event software for fairs, exhibitions, museums, roadshows, congresses, info terminals, and any other special task where you want to attract your customers with sophisticated technology. Video screens and modular LED displays are the perfect customization for your fair stand. The screens are mostly considered as a means to show video and advertising material of the latest products and thus meant to be a magnet for visitors. But with interactive software developed especially for the trade fair, you can get even more out of them. 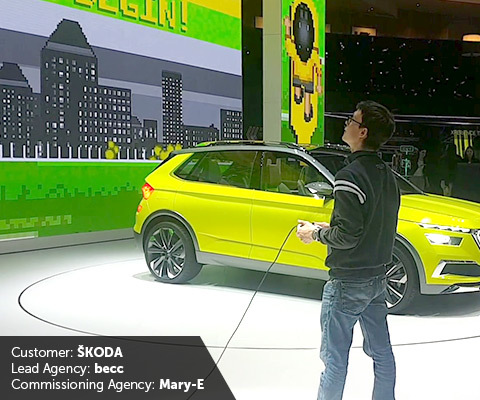 An example taken from our references: Two visitors each were able to duel directly on stage in the ŠKODA E-Mobility Game at the Geneva Motor Show 2018. 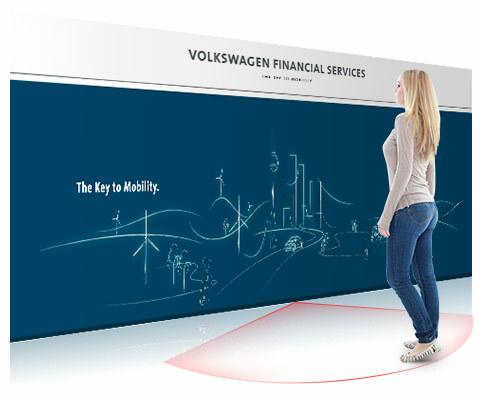 With live commentary on the digital race, the short duels on the 70 sqm LED display wall entertained the amazed visitors and were thus able to playfully spread the advertising message of ŠKODA on E-Mobility. From November 27th 2014 to January 31st, 2016, the BMW Museum presents the new temporary exhibition about the world's favorite car brand MINI. Visitors will find more than 30 fascinating original vehicles, precious small exhibits and lots of information and background stories. As its highlight, MINI presents the interactive exhibit MINI Connected at the 5th floor of the museum. Here visitors can venture an exciting hyperlapse ride through international cities in the new MINI Cooper S.
To realise the exhibit, BMW trusted three strong companies from Bavaria. The Munich-based agency for brand space & design MARY-e GmbH was responsible for the idea, the design and construction of the exhibit. Fritz Stoiber Productions GmbH created all animated and filmed content. We, the at² GmbH from Nuremberg, developed the software solution to guarantee the smooth running of the exhibit and all its interactions. In less than five weeks the exhibit was fully implemented - up and ready for the grand opening of "The MINI Story" to cause enthusiasm among the invited guests. 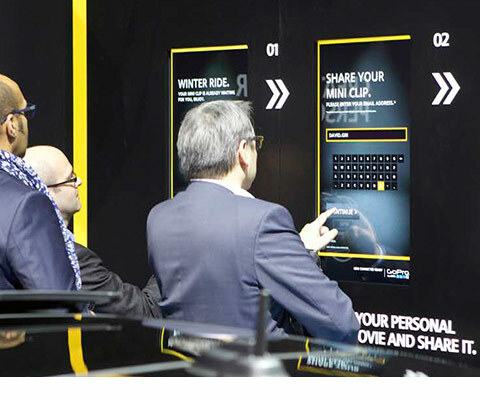 DIRIMOTE revolutionizes the possibilities of interactive shop windows and transforms the attention into unique individual experiences. 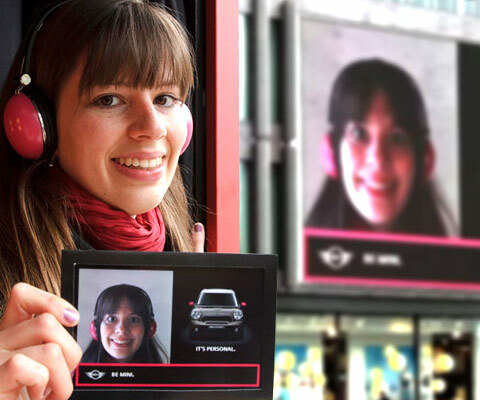 The passerby's smartphone becomes the remote control for the interactive shop windows. By scanning a code, the smartphone connects to the exhibit in the shop window and displays all control elements right on the phone display. For this new take on interactive shop windows we received the WE DO DIGITAL Award in the category "information and communication" on June 15th, 2017. 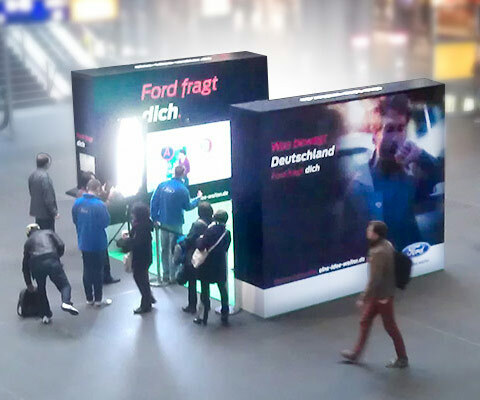 The DIRIMOTE technology strengthens the local retail industry and raises passerby awareness with interactive exhibits in front of the store - even outside of business hours. By direct integration of the passerby's smartphone as the remote control, it's very easy to share the experience on social media and expands the stores reach far beyond the pedestrian area. With DIRIMOTE vandalism-proof input devices for interactive store windows are no longer required. DIRIMOTE can be integrated into a variety of exhibits, e.g. it's possible to add DIRIMOTE to existing shop displays to save on hardware costs. Of course our company also offers classical marketing instruments like interactive sweepstakes, digital address form sheets, info terminals or newsletter mailings. Digital media solutions do not necessarily need keyboard and mouse to ensure interactivity. Thanks to modern technology, your exhibit can also be controlled by touch screens, object-, gesture- and face-detection, infrared and laser scans, Microsoft Kinect or chroma keying (greenscreen effect). These new and unfamiliar ways to interact with an exhibit are sometimes all you need to make your visitors want to participate.